1. With a bike or two on board your campervan or motorhome you’ll be able to access more places and add even more flexibility to your itinerary. 2. 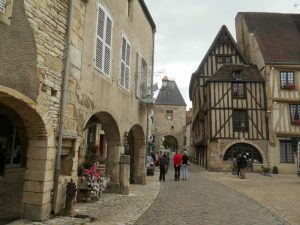 Many ancient villages and cities in France have ancient roads too (some of them are not even suitable for cars let alone campervans), which makes cycling the best solution for exploring narrow, often cobbled, streets. 3. France has a very positive approach to cyclists. Just like motorhomes, bikes are welcome practically everywhere and the facilities provided for cyclists are first class. There are more than 20,000 kilometres of marked cycle paths throughout the country, including 7,000 kilometres of “Eurovelo” routes, which link France to its European neighbours. 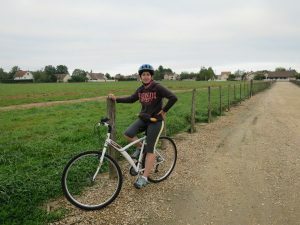 For more information about European routes take a look at EuroVelo.com and for detailed information (and suggested itineraries) in France check out France Velo Tourisme. 4. Virtually every town and village has made some kind of provision for cyclists, with dedicated cycle lanes on many roads and marked cycle tracks in towns and along tourist trails. Waterways make for lovely scenery too; many of the main rivers and canals of France now have dedicated cycle tracks that follow their entire length, such as the River Loire and the Burgundy Canal. 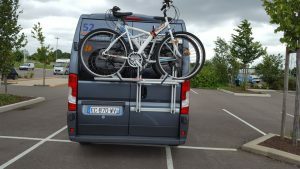 We recognise how useful bikes are – we use them ourselves whenever we have the chance to escape from the office, so all our motorhomes and campervans can carry bicycles on fitted cycle racks, and if you hire the bikes from us we provide bike locks too. The law does not require you to wear cycle helmets in France, and, as much of the cycling is done away from roads, many cyclists don’t wear one. However, you are welcome to bring one if you are happier wearing one. (You can buy a safety-tested helmet from about €12 upwards at hypermarkets or sports stores.) The only law that might catch you out is that it is obligatory to wear a reflective/high-visibility vest if you are cycling outside of built-up areas at night or in poor visibility. If bringing your own bicycles is out of the question, but you’re tempted by today’s blog, you’ll be delighted to know that our autumn special offer (which applies to all new bookings that start by 22nd December 2016), includes TWO adult hybrid bicycles (that’s a bike that can cope with road and most off-road conditions and is suitable for most riders over the age of 12) free of charge for the duration of your hire. Go here to get the full details of the special offer. We look forward to loading your bikes and starting you off on your motorhome and cycling trip soon! ← Our local city of Sens, interesting by day and stunning by night!